Hi guys, a very happy Sunday to you all! As it is a bank holiday weekend I thought I would share with you all my at home hair treatment mask which I have been using myself the past few weeks and which I also shared over on my snapchat recently (TheStyleShaper1). It was a complete hit with all of my lovely followers, so I am bringing it to you now! I have to say it is one of the most effective hair treatments I have ever used, to the extent that it has completely riddled my hair of dry scalp and leaves an unbelievable shine on the hair. Mix all the ingredients together and apply to the hair, massaging into the scalp and down onto the ends of the hair. If you feel you need more of the treatment to cover, just whisk up a little more! Leave this in the hair for a good 20 minutes and then rinse out. When you have rinsed it out, continue on with shampooing and conditioning your hair as normal. Hi guys, I hope you are all keeping well! Today I wanted to go through in detail my current everyday skincare routine which I know a lot of you have been asking about especially over on my snapchat (thestyleshaper1). 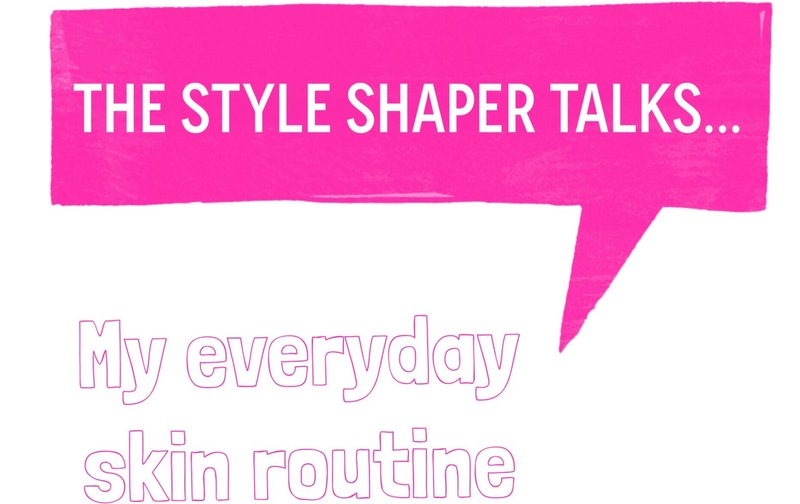 The reason for this blog post coming so late to you guys is simply because I didn’t want to start recommending products when I hadn’t given them a good run through myself. I wanted to try a few different products together and see how they worked as a whole routine and whether I could see a difference in my skin. 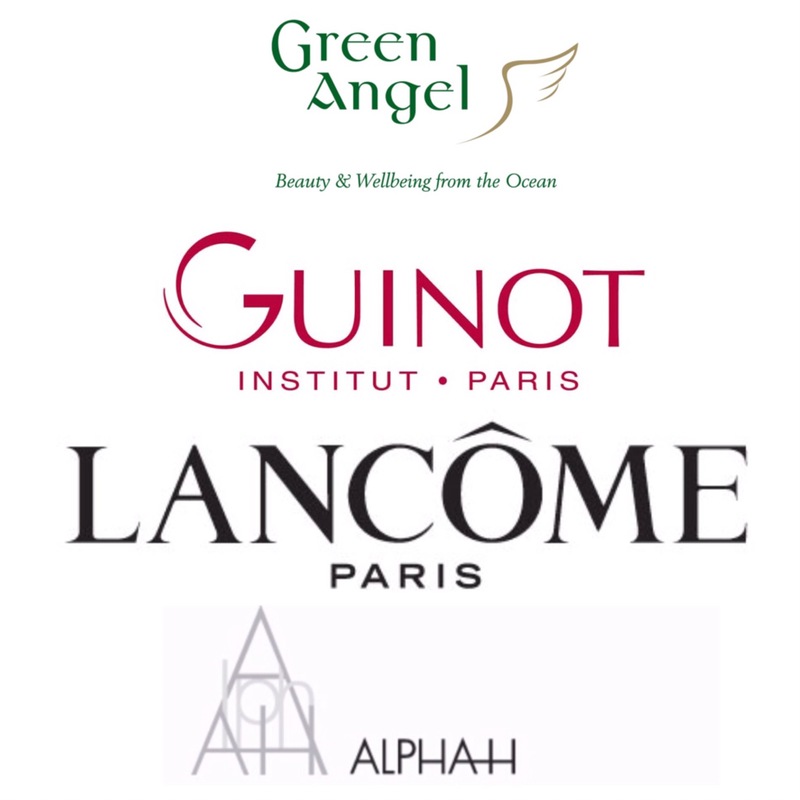 Are the products suited for your skin type? Is there any irritation occurring? Are they drying on the skin? Can you notice a vast change in your skin? etc. Keep on reading below to find out all there is to know about each of the products I use in detail and how I combine them to achieve glowing skin! I have combined all of the above products together to create, for me, a fabulous routine which myself and my skin is LOVING at the minute. To say I have noticed a change in my skin would be a complete understatement as I can notice signs of reduced wrinkles around my eyes, a reduction in redness on the skin and a serious difference each (lady) month😉as I always find the skin around my chin area breaks out. I can now also see a major reduction in the size of my pores. Below, I will share with you each step I go through while cleaning my skin along with how and why I use these particular products above! I start by removing my eye make up. Some may leave this stage a little bit later in the process, but I do it by habit to be honest! 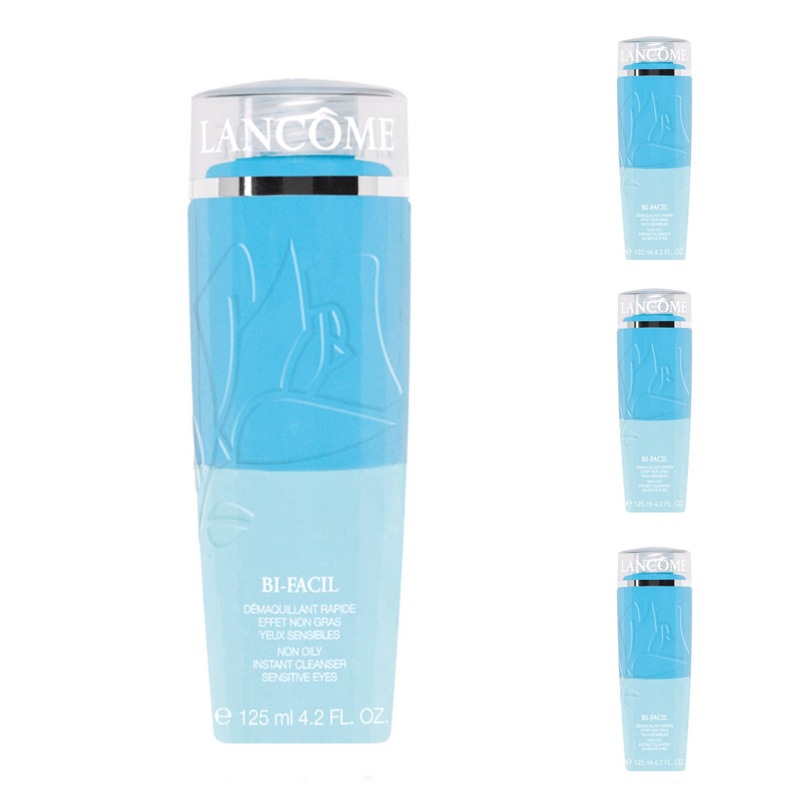 For this I like to use the Lancôme Bi-Facil eye make up remover as it is so gentle but works amazingly on breaking down the make up on the eyes. I put the solution on a little cotton pad (from Penneys/Primark) and massage around the eyes until I know all mascara is removed along with shadows and liners. This particular remover is so gentle that it can be used on extremely sensitive eyes and even on those who wear contact lenses. There are so many cleansers on the market at the minute but it is important to find the right cleanser that suits your skin type. I have always used just one, but in recent months while speaking to a beauty industry expert, I learned the importance of doing TWO cleanses on the skin and using TWO different cleansers for this! Now I know you are probably thinking this is mad, but doing this the last few months it has really helped in giving my skin the clean that it needed along with balancing my skin. The two cleansers that I can’t live without at the minute are the ALPHA-H ph balancing cleanser and the Kinvara cleansing oil which is an Irish product. 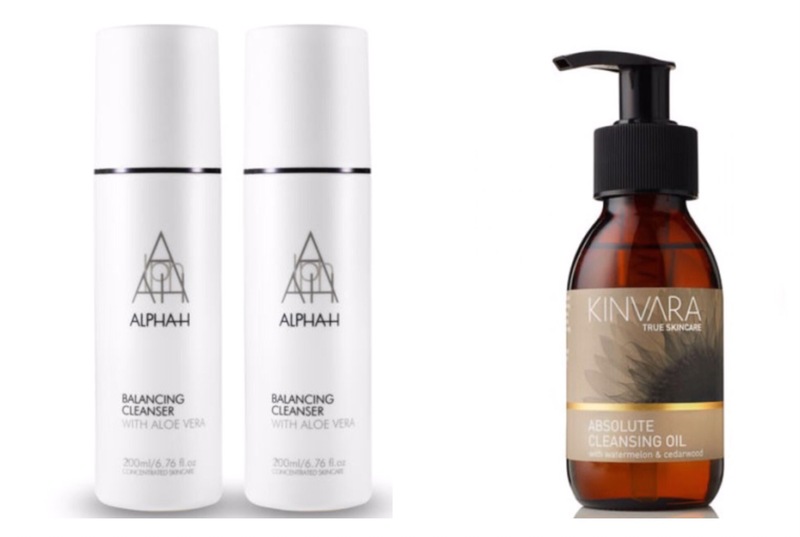 I firstly do an all over cleanse with the ALPHA-H balancing cleanser, wiping it away with a dry cotton pad, then go in with the Kinvara cleansing oil for another deep cleanse on my skin. I again wipe that away using a dry cotton pad. While doing each cleanse I spend about two minutes rubbing the cleanser into the skin using circular motions making sure to remove all make up. Ok, so hands up who forgets or doesn’t bother to use a toner on the skin?? I’m guessing quite a few of you stop at just cleansing the skin right? Slap on a mountain of moisturiser and on you go!😂 Well guys unfortunately you are skipping a vital part of your skin routine. When you cleanse your skin you are leaving a layer of product on your skin. You might not feel it or see it, but what you are actually doing is leaving that product on the skin, applying moisturiser over it and in return the cleanser will soak in and block your pores which may cause spots. By using a toner you are taking that layer of product off, leaving the skin clean and refreshed. Toner is also a major key as it balances the PH in your skin. 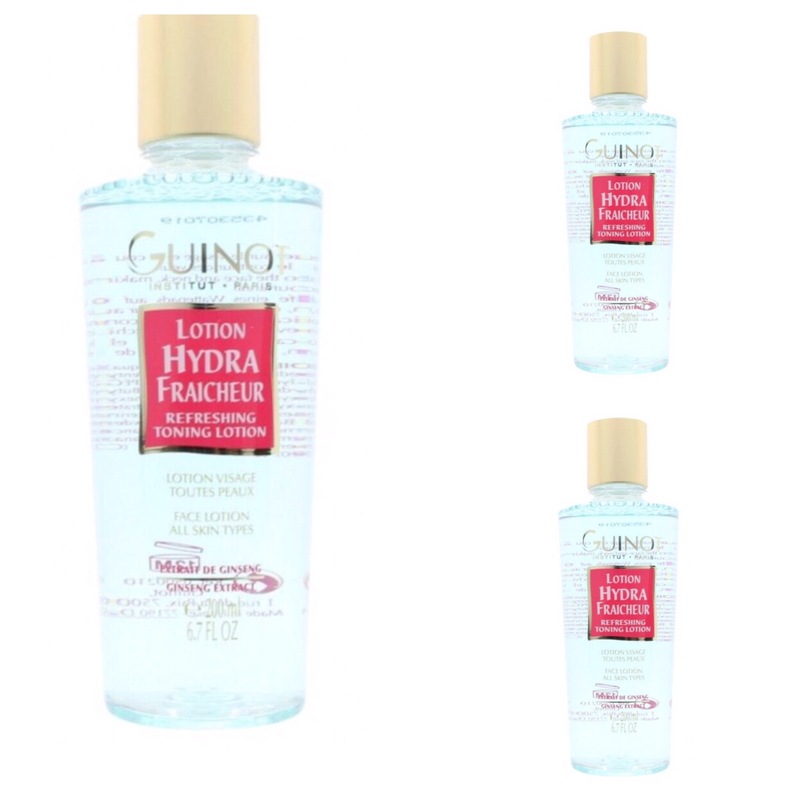 The toner I love using is the Guinot Hydra Fraicheur refreshing toning lotion. This one in particular leaves the skin leaving completely refreshed and also enriches the skin with plant extracts. I have to admit, it has only been in the last few months that I myself have started using a serum! Experts say you should start using serums from the age 18 when the skin begins to mature and experiences the harshness of everyday life like smoking etc. The serum I began using is the Lancôme Génifique youth activating concentrate. It feels amazing on my skin and I feel by using this, my skin looks a lot brighter and refreshed. To apply this, I take two to three drops, rub between clean finger tips and in circular motions apply to the skin. We all love slapping on the moisturiser don’t we?! But in reality you only need a very small amount. 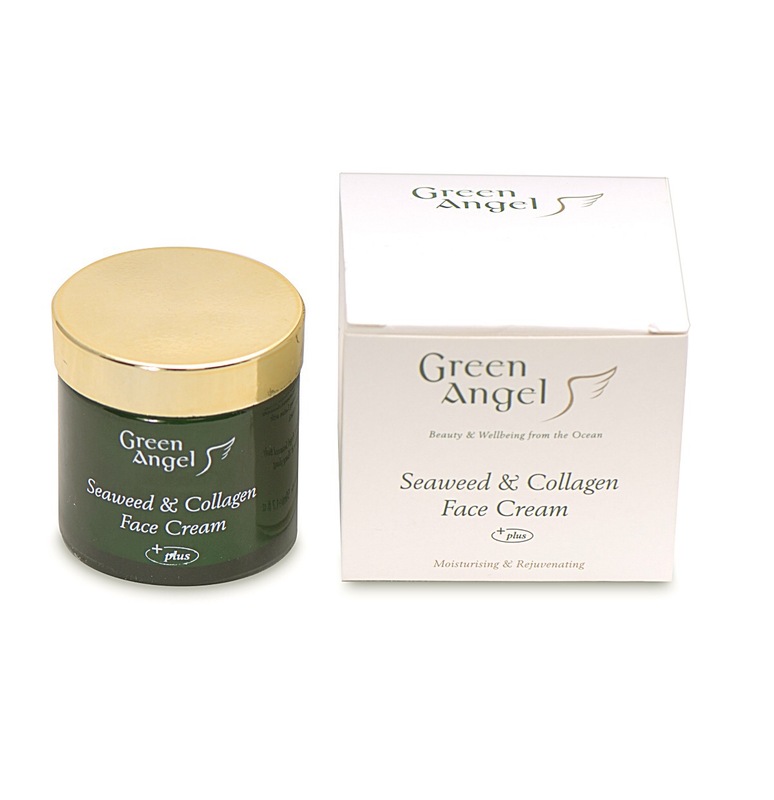 The moisturiser I’m using at the minute is the Green Angel seaweed and collagen cream which is an Irish made product and is completely natural. I take a pea size amount and dot it around my face so I then have that particular amount to rub into my skin. I use the ALPHA-H liquid gold with Glycolic acid once or twice a week to revive and brighten my skin. When I say this is gold in a bottle, I mean it! This is literally like having a facial in a few seconds! It can be used on its own, or you can leave it on going to bed and wash it off the next morning and it will leave your skin feeling tighter, brighter and beautiful! I was kindly gifted this to try and I will definitely be purchasing again as it has become a vital part of my regime. With this, my skin feels amazing after use and I have definitely seen a reduction in my wrinkles due to the Glycolic acid present in the product. I do this routine twice a day. In the morning if going bare faced, and also before applying my make up. -After applying my moisturiser I then apply my make up primer and start my make up. I then repeat the routine at night time when taking off my make up! Below I will list my favourite place to find each of the above products I use. So guys I hope you have enjoyed this post and hopefully it has answered some of your questions! If you have any more, don’t hesitate to contact me on any of my social media platforms! As I received the February box, the delivery contained an amazing array of all things furry and adorable to a beautiful doggie scent for Valentine’s Day of course😉 I also recieved the March box which I will include on here too! 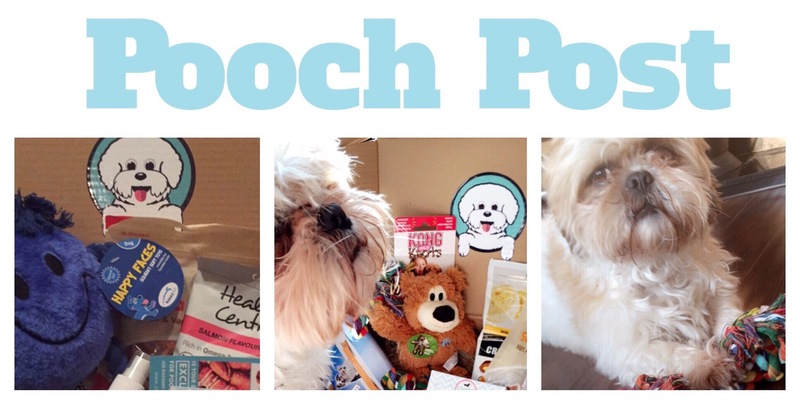 Pooch post is a monthly subscription box which you can get sent straight to your door for the pooch in your life🐶 Pooch Post is a recently established Irish company and is based in Co.Kildare. I think what I love most about the box is that Pooch Post collaborate with other Irish brands to bring the best products to the subscription box which gives us all the chance to support Irish as well. 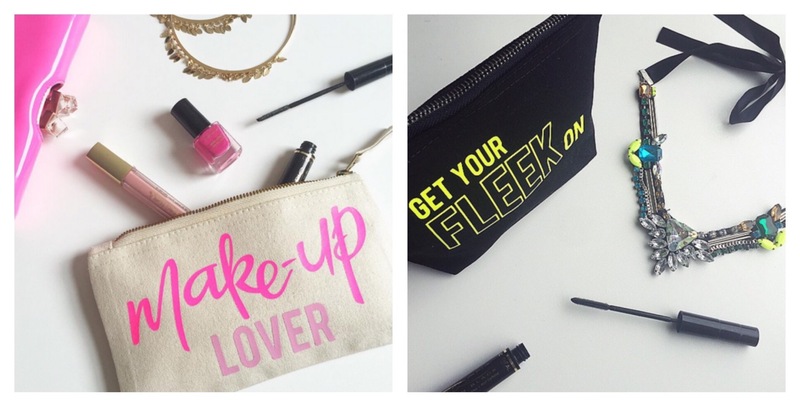 All subscriptions can be cancelled at any time and shipping is FREE!! The Pooch Post boxes are posted out to your furry friends on the 15th of each month, so if you place your order before then you will receive your post in the next few coming days! Along with ‘Ted’ came a selection of treats which were 100% natural and which helps with your pooches teeth, one of their 5 a day and which helps with their coat. I loved this element of the box as I know myself that I am giving Ben the best possible treats out there and which benefit him. My first impressions of the box as a whole was – WOW! Everything from the presentation of the products to the logo was outstanding and extremely professional. Parcels are also delivered by Fastway couriers so you know you Pooch Post is safe! 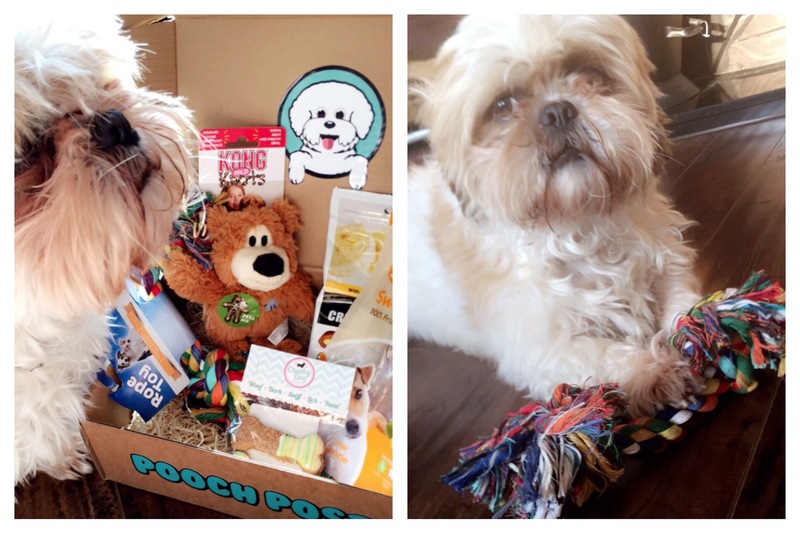 I would highly recommend this monthly subscription box for your pooch! Everything is of the highest and best quality and comes boxed and presented perfectly! If we were to rate this box I’m sure Ben would give it 10/10🐶 as would I! It is a fantastic way to treat your dog and have something to look forward to each month too! Prices for the Pooch Post subscription boxes range from €24 to €29 per month depending on which subscription length you wish to avail of. You can find all the information you need here! 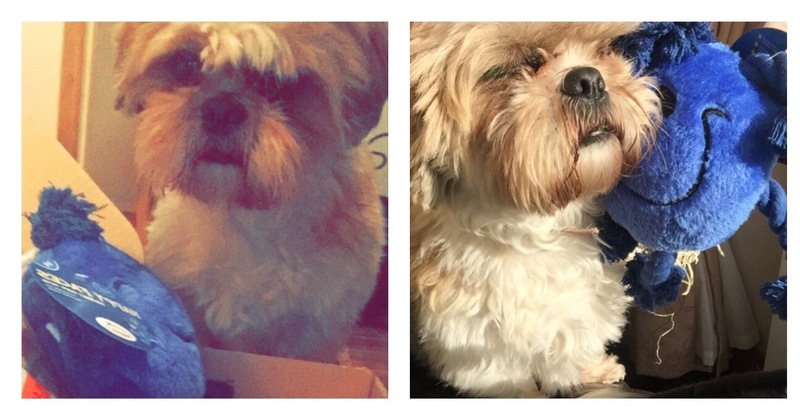 I hope you have enjoyed this review on Pooch Post! I just had to share this with you guys as I think it is a great way of treating your dog, but also because it contains the best possible products for your pooch! Hi guys and a very happy Tuesday to you all! So, as you can all see from the above title ‘steal her style’, I have decided to add a section to my blog which will be dedicated to celebrity inspired looks but all on a street-style budget! 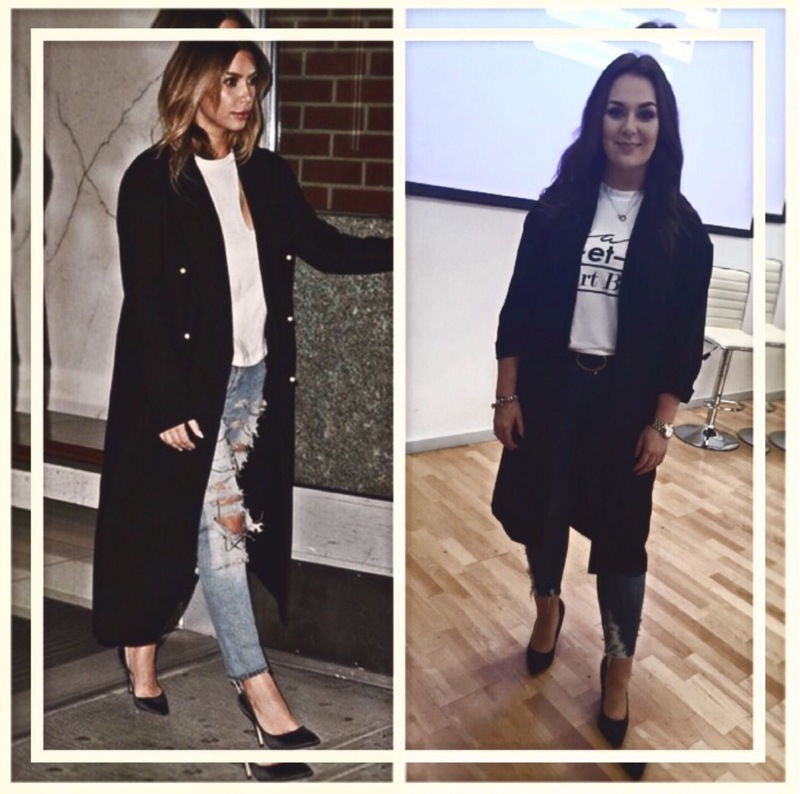 My first look below is inspired by the beautiful Kim K, and one which I recently wore to the ‘Dream It, Do It’ event. I have to say, I am quite the fan of Kim’s recent style choices. They are laid back, chic and make a statement. I am also a firm believer in dressing for your body shape and she has mastered just that! So as you can see from the picture above, I opted for white logo tee with dark denims and a black duster. Black pointed heels were a must to also complete the look! 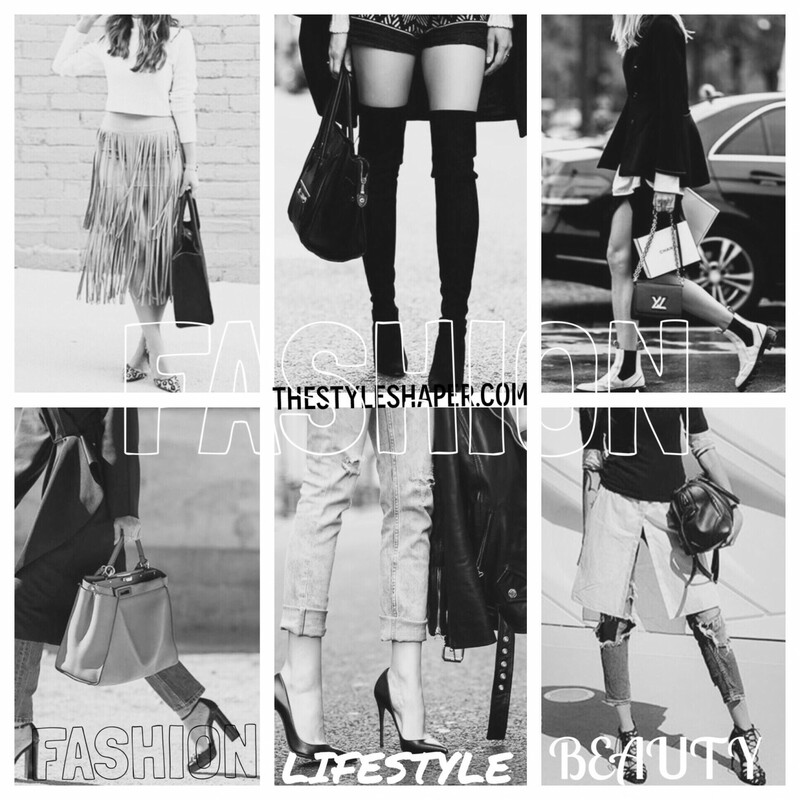 So guys I hope you love this new little addition to my blog! I will aim to bring you as much celebrity inspired looks as possible, but from the high-street of course! Hello everyone and a very happy new year, I hope you all had an amazing Christmas and have eased into the new year nicely! As my first post of the new year, I am bringing you guys a series of posts which will include an update every six weeks of my Laser Hair Removal with the amazing Sam McCauleys beauty salon in the Fairgreen shopping centre Carlow. I recently had my FREE consultation done with the lovely Nikita in the salon which may I say was a treat as I was a little bit nervous, I suppose because laser is something I would never have considered before talking with the ladies in the salon and seeing the amazing results after just 6 treatments. Read below to find out all there is to know about this mind blowing treatment available from Sam McCauleys and how I got on with my free consultation! 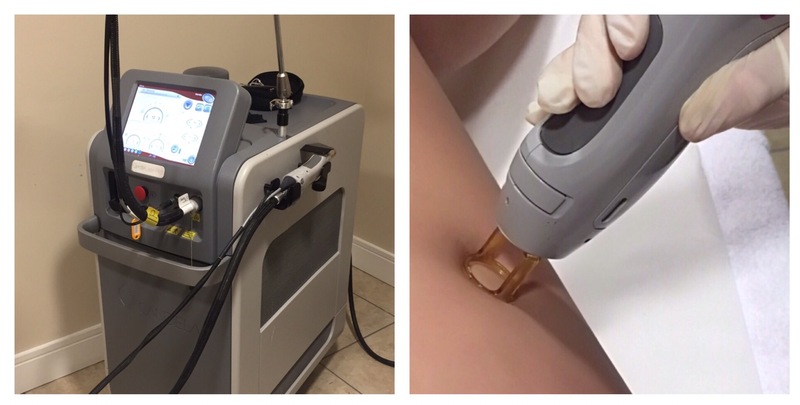 Laser hair removal is a safe, effective and commonly used treatment, providing optimal results in the removal of unwanted hair. Lasers work by delivering an intense beam of light that is absorbed by the pigment in the hair which is converted to heat effectively destroying the hair shaft, while leaving the surrounding skin unaffected. I decided to have the laser hair removal treatment done on the bottom part of my legs as I suppose it’s every girls dream not having to shave her legs! Who agrees?! I thought that coming into the Summer time and not having to hide my lower leg, worrying about stubble if I had forgotten to shave and also a big part of my decision for the laser hair removal was to feel good about having my legs out and about. 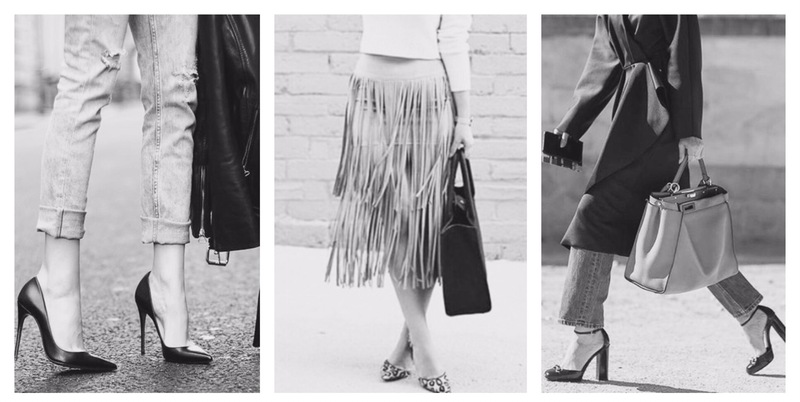 Being a part of the ever growing fashion industry and also having my blog, I am always conjuring up new ideas, outfits, looks, and as we are approaching the Summer season it means cropped trousers, skirts, culottes and dresses which in return means hairy legs are out! On Tuesday I had my free consultation and patch test with Nikita who is my laser hair removal specialist. The consultation went extremely well which I was delighted with. –A consultation and patch test is required with laser hair removal to ensure you are compatible to laser. I was brought in to one of many lovely rooms at Sam McCauleys beauty salon. Nikita explained all the information I needed to know including how the laser works, about the top rated Candela laser machine, preparation, aftercare and the FAQs which put me at ease as I didn’t know what to expect! As part of the consultation, I had a small patch test done on one area of my leg as to see would I have any reaction (which is quite rare) to the laser itself. This consisted of having the small area cleansed and then zapped twice with the laser beam. What I love about the Candela machine they use in Sam McCauleys is that it shoots out a blast of coolant before the laser beam, so you literally can’t feel a thing! It was done and I didn’t even realise! This feature on the Candela gives greater patient comfort and safety which in return gives greater results. All laser hair removal consultations are completely FREE with Sam McCauleys in the Fairgreen shopping centre Carlow. You can book your free consultation via the website – http://www.sammccauleys.com and go to the ‘Beauty Salon Bookings’ section or call in store at the Fairgreen shopping centre Carlow. To achieve maximum and completely satisfactory results with laser hair removal it is advised to have a total of six treatments. I will be having the six treatments done with a six week gap between each treatment. When with your therapist, you can discuss cost along with a payment plan that suits you which is another fantastic plus to having laser done with Sam McCauleys. For my complete six treatments the total cost is €585 which isn’t a lot when you consider having hair free legs forever! I have also worked with the girls and we have drawn up payment plan which makes life so much easier. Are laser treatments safe? Yes, laser treatments have been used for many years for a variety of medical and cosmetic procedures. Candela, the most trusted name in the industry, has pioneered the development of some of the safest and most effective technologies and products available on the market today. What will my treatment be like? You and your therapist will wear safety glasses to protect your eyes during the procedure. The therapist will use a small hand piece that touches your skin to deliver the light. You will feel a light spray of coolant on your skin before each laser pulse. How long will my treatment take and how many treatments will I need? Every treatment, like every client is unique. Consult your therapist to decide what is the best for you based on your needs and expectations. A minimum of 6 treatments is generally recommended depending on the area to be treated. What precautions should I take before or after my treatment? In general, avoid sun exposure for 2-4 weeks before treatment and again after treatment until your therapist allows it. Care should be taken in the first few days following your treatment. Avoid scrubbing and rinsing the treated area with abrasive skin cleanser. Consult your therapist for specific precautions that relate to your individualised treatment plan. Are there any adverse side-effects to laser treatments? Most procedures have a low risk of adverse side effects. Some patients experience pigment changes in the skin colour. If this occurs, the skin will typically return to normal pigmentation over time. All treatment results are individual. Is my laser treatment covered by my medical insurance? Most insurance companies do not offer reimbursement for cosmetic procedures. However, consult your therapist for more information. What is the next step? The first step is a FREE consultation and patch test to ensure that you are compatible to laser. Cost discussion and a payment plan will be organised for you at Sam McCauleys. So guys and gals I hope you have found this post interesting and educational on the laser hair removal front. Don’t forget if you are in anyway interested in having laser hair removal done, don’t hesitate to book in your FREE consultation! Hello everyone and a very happy Wednesday to you all! As Christmas is upon us, I thought that it would be a fabulous idea to share with you all one of my new favourite online stores, The Dotty Lemon, which is a fabulous spot for gorgeous gift ideas for this coming festive season. I had the absolute pleasure of meeting creator of The Dotty Lemon, Aisling Power to hear her story and what lead to the creation of this amazing online store. 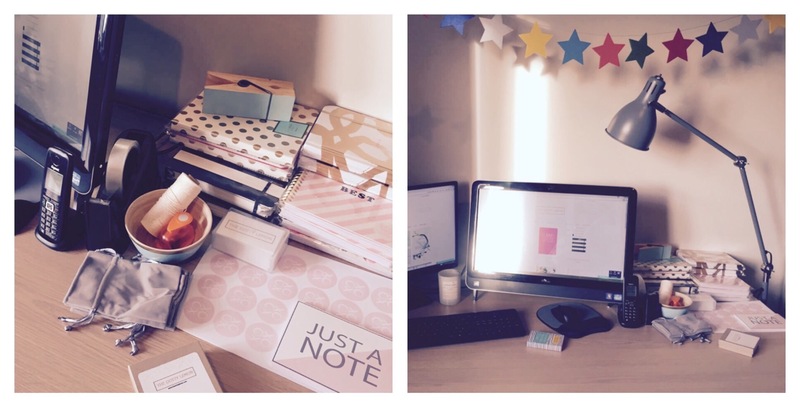 The Dotty Lemon is a gorgeous online site which carries an array of beautiful jewellery and statement pieces to branded diaries and stationary. All of the pieces are known for their quality and style, and if I may say so myself, are just simply stunning! Aisling and her husband Brian live in a small village in Cork with their beautiful little boy Ollie. Aisling having a background in Architectural Technology works part time as an environmental consultant and also as an AutoCAD technician. Aisling says she has always loved the idea of a new and exciting venture and that’s exactly what she has done with The Dotty Lemon. Brian has his own company AvantechLabs, which is a web development company. Aisling says Brian was quite keen for her to start an online store as he could help with the site development. The Dotty Lemon launched on September 30th 2015 which is still quite early days says Aisling. Considering the early launch, The Dotty Lemon has stunned by appearing in The Sunday Business Post Magazine, has been featured on One Fab Day and pieces have also been seen on the gorgeous Marissa Carter, CEO of Cocoa Brown Tan. All of the products and pieces available from The Dotty Lemon are sourced from the UK and Europe and are selected with uniqueness, style, quality and fabulousness in mind. The inspirational bangles which come in rose gold and silver have wowed everyone with their simple statement messages and quality along with the double pearl bangle which comes in rose gold and silver too. I have this bangle myself and I have to say, I love it! It goes with everything, and can be easily stacked with the other pieces or simply worn on its own to make a statement. At the minute a fabulous jewellery designer from New York has worked on a selection of beautiful pieces called the Beq Pettina Morse Code collection. These are delicate necklaces and bracelets made with small round gold beads on a silk thread and that spell the words Love, Dream and Believe in morse code. The Beq Pettina Morse Code collection is now available at The Dotty Lemon and is exclusive to Ireland and the EU so you can step out in style with these dainty pieces. Apart from stunning pieces of jewellery, The Dotty Lemon also has a gorgeous selection of Kate Spade and Ban.Do Diaries. These diaries in particular have caused quite a storm recently and are selling out everywhere! But as you can imagine, it is no surprise as they are a statement to themselves. So guys and gals, I hope you have enjoyed this post as much as I have! 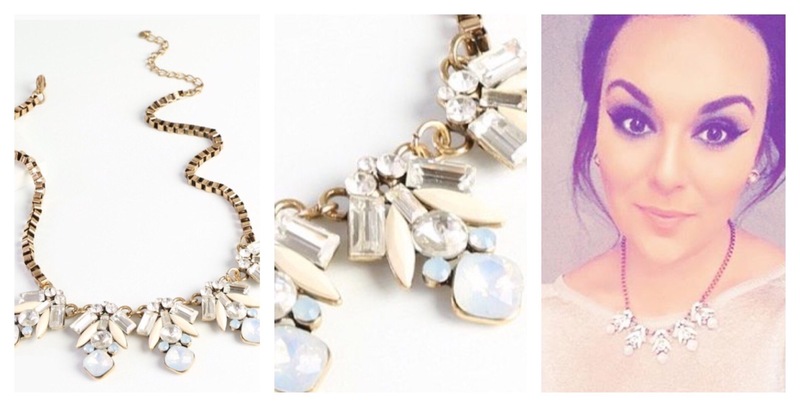 There are some fabulous gift ideas above along with gorgeous little stocking fillers! Well what an amazing few weeks! I am completely blown away by the fabulous events the past few weeks, including the two ‘Dream It, Do It’ events which I was asked to speak at along with the amazing Spa and Style event which I was invited to at the Lyrath Estate hotel in Kilkenny this week. 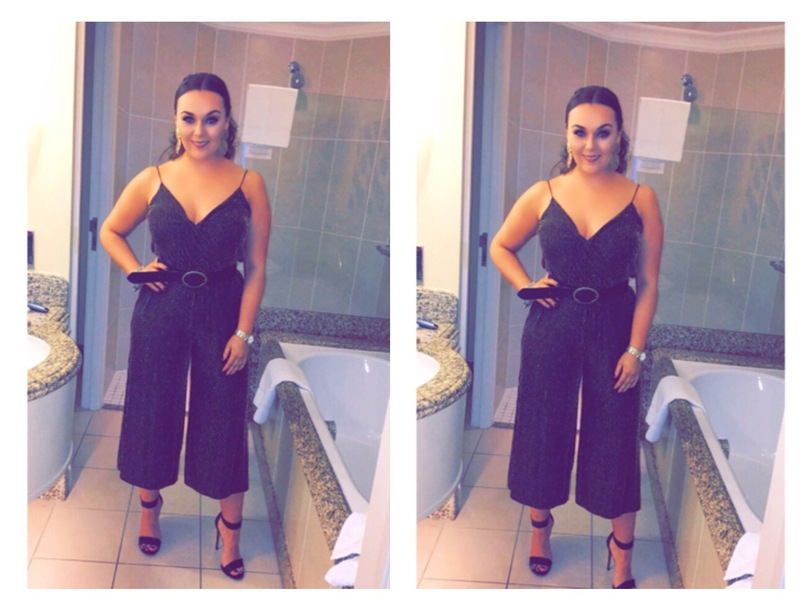 Today I am going to talk you through the Spa and Style event which I attended on Wednesday evening in Kilkenny and which was hosted by the Cocoa Brown queen herself, Marissa Carter! I will also include a full outfit post which I know a lot of you fashionistas are asking about! 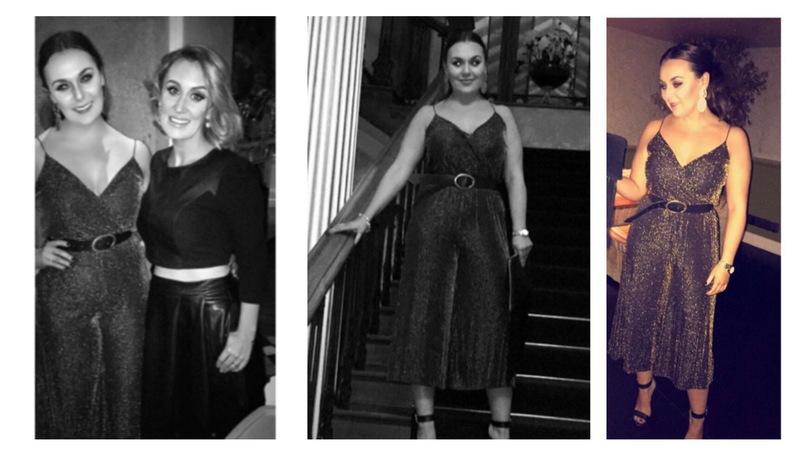 So keep those eyes peeled and keep on scrolling to see all about the event and what I wore! On Wednesday 18th of November, I made my way to the fabulous 5 star hotel that is, the Lyrath Estate in Kilkenny. I was honoured to attend the Spa and Style event at the Lyrath which was a fabulous evening filled with all things fashion and beauty – the perfect girls evening! When we arrived, we were greeted by the lovely ladies on reception and of course by our amazing host, Linda, who had an evening planned for us which was out of this world! We made our way to our rooms, which may I add were beautiful. We were blown away by the attention to detail in the rooms and also so lucky to have an amazing balcony off our room which enabled us to view the gorgeous grounds of the hotel. We glammed ourselves up and made our way to the yellow room in the old building of the hotel for some champagne and nibbles. While there, I had the amazing opportunity of meeting the other fab bloggers who were there for the evening. The fabulous Laura, from Laura Dempsey make up, Jen from Too Dolly make up, Nikki and Ber from the fabulous online store My Shining Armour, Nic from The Naked Blondie, Dawn from Glamour! By Dawn, Karen from KarenMaherMakeUp and of course the beautiful Linda. We had a beautiful dinner at Yindees restaurant which is a gorgeous Asian restaurant at the hotel followed by a tour of the award winning Oasis Spa. What came next was fantastic! We watched an amazing fashion show from upstairs in Yindees, which meant we had a birdseye view of the show which was being hosted by the fabulous Marissa Carter. It was my first time to meet Marissa, and oh my goodness, what an amazing woman she is. The fashion show kicked off with amazing pieces of clothing and accessories from boutiques around Kilkenny, including Lola Rose and the Kilkenny design centre. All of the gorgeous girls from the hotel spa, ‘Oasis spa’ were there showcasing the fab products available in the spa along with an amazing display of the Elemis range. I know a lot of you guys have been quite anxious to know all the details on my look for the night, so here they are! Hair and make up – I completed the look myself! So guys and gals, that’s my look! I hope you enjoyed reading about my amazing experience at the Lyrath Estate Hotel and Spa, Kilkenny. It truly is one of the nicest hotels I have stayed at. Just fabulous! A huge thank you to the Lyrath for an amazing evening and for looking after us. Also to Linda who was our amazing hostess for the evening. As some of you may know I was kindly invited to the fabulous Heavenly Hair salon in the Pavillions Shopping centre Swords to try out one of their gorgeous hairpieces – the ‘Halo’. During this post I will share with you all there is to know about this amazing hairpiece. 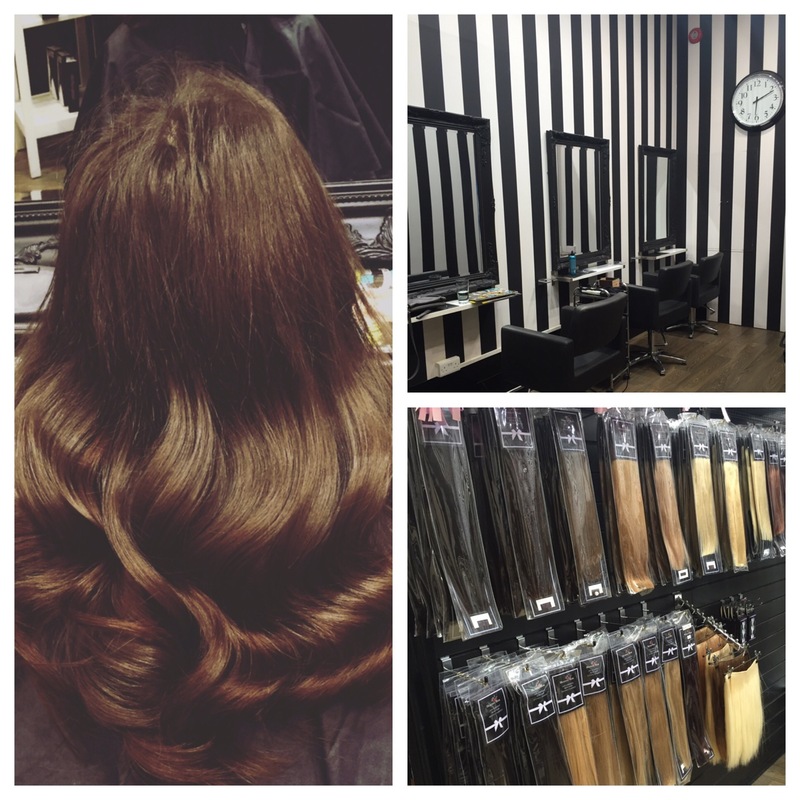 Heavenly Hair is one of Ireland’s leading suppliers of premium double drawn 100% human hair with over 15 years experience in the industry, so you can just imagine how excited I was to visit! With two salons, one in the Pavillions Shopping Centre in Swords and one in Scotch Hall Shopping Centre Drogheda, I made my way to our beautiful capital to visit the Swords salon. When I first arrived at the salon, I was greeted by a lovely lady, Amy, who brought me to my seat in the gorgeous salon space and explained to me what the ‘Halo’ hairpiece was all about! Amy went through everything and was so lovely and chatty which was great as I was a little bit nervous! 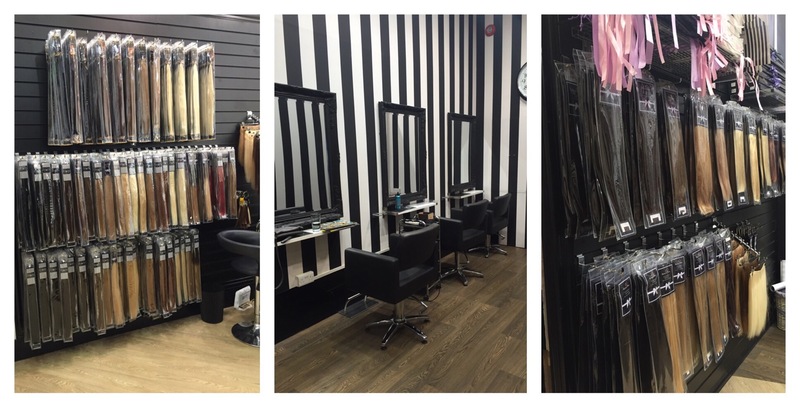 The salon itself is fabulous, spacious and modern with comfortable seats and top of the range tools. The range of hair colours to chose from is also outstanding as they have a colour that will cater to everyone. To say I have experienced my fair share of hair extensions in the past would be an understatement! I think I have tried them all at this stage, from synthetic hair, micro beads, to clips and back again! But I can honestly say that I have never tried anything like this ‘Halo’ hairpiece! It is AMAZING! So as Amy was explaining about the hairpiece, she then went and got a few to see which colour would best suit my hair colour. As my hair has never been dyed before it was hard to differentiate between two colours but we decided on the darker brown colour in the end as it best suited my own hair colour. The ‘Halo’ hairpiece to my surprise is actually a full piece of double drawn, premium Spanish hair that you can wear as the ‘Halo’ or you can also take with you clips and use it as a clip in piece! Now, when I first seen the piece I assumed it was going to be a clip in hairpiece, but guys I was completely wrong as it is so much better!! The ‘Halo’ name refers to the fact that the piece itself is positioned on the head using strong fishing string! I know how crazy I sound right now, but it is genius! The fishing line is attached tightly, knotted six times to each end of the hairpiece to ensure the hair won’t come away from the line. This is then placed at the top of the head, making sure that the hairpiece itself sits just under the bone at the back of your head! You then pull the hair out over the line, and style how you would like your split or fringe! I was a little bit sceptical at first as I thought this would move the minute it was touched, but guys it honestly doesn’t budge! I can’t believe how easy it is so put on and take off! There is absolutely no worrying about backcombing the hair to apply the clip in ones or bulking clips and hair! 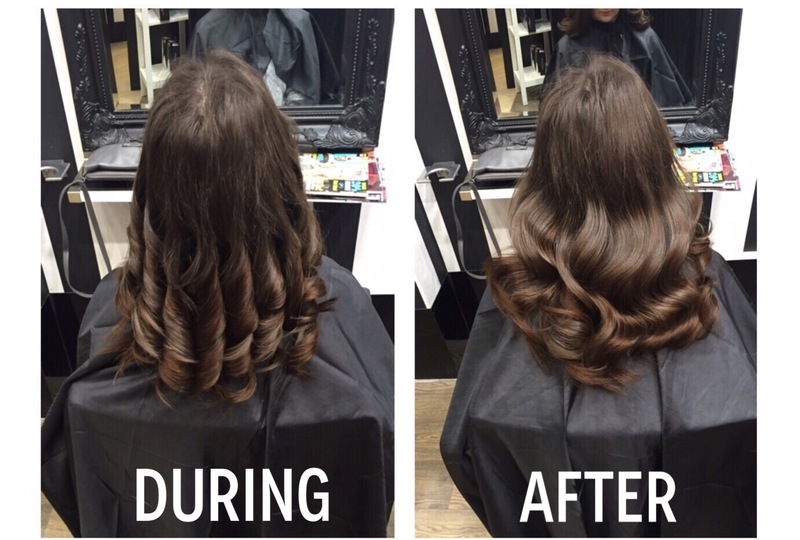 The hairpiece is 100% human Spanish hair which means you can curl, straighten, blowdry do what ever you like with it which is just amazing and gives you the option to have it straight or curly! I absolutely love the hairpiece and would highly recommend it to anyone looking for the extra length or volume in your hair. I hope you have all enjoyed this post on this gorgeous hairpiece! I haven’t stopped wearing mine! 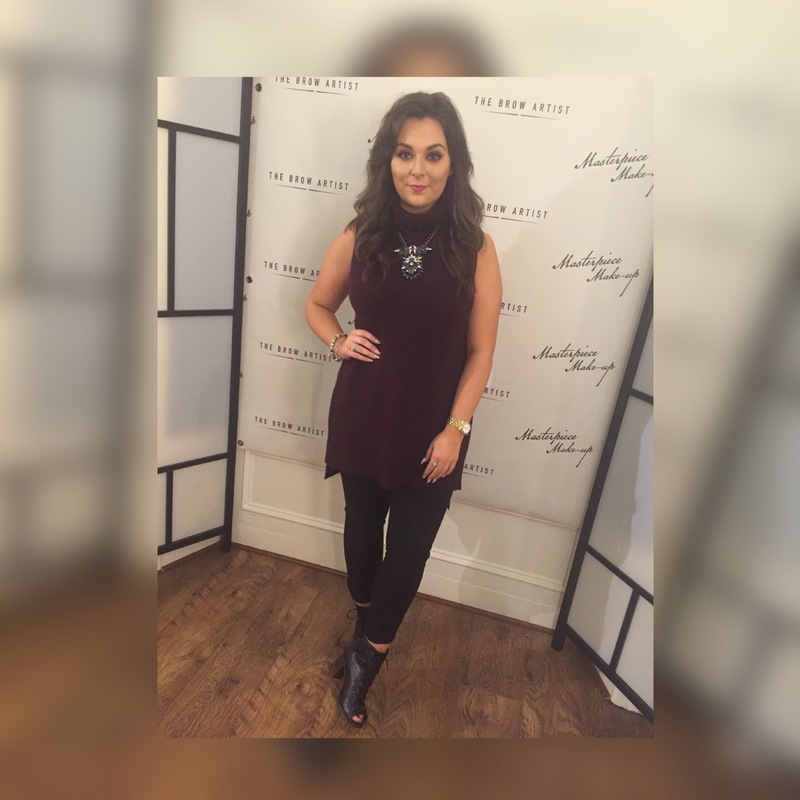 What I wore – The Brow Artist event. I hope you have all had an amazing bank holiday weekend! As some of you may know, I attended a fabulous event in our beautiful capital last night. 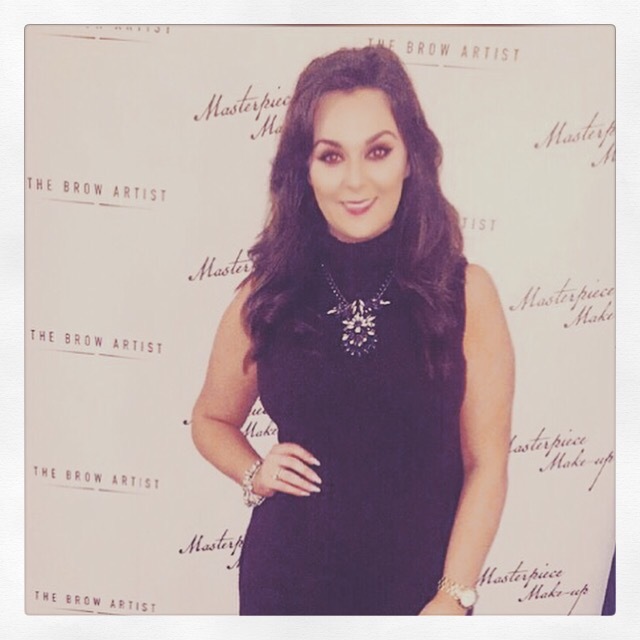 ‘The Brow Artist’ in Ranelagh launched ‘The Make up Artist’ in their amazing studio. It was such a lovely evening and great to meet new faces. As promised I am going to share with you my outfit details and any questions you guys may have, don’t hesitate to contact me on any of my social media platforms. I immediately fell in love with this simple little jumper the minute I spotted it in none other than Penneys/Primark. I am a winter woolies hoarder and have many polo necks, but find when pairing with a coat, it’s quite hard to tame down the bulking sleeves. So how perfect is a sleeveless one for winter right?! I themed this with my light cotton grey coat from Zara. The jumper also has slits up each side along with a slightly longer back. This gorgeous turtle neck was just €14 and is available in stores now. I’m afraid I am going to disappoint when it comes down to the shoes! I have these little booties forever! I remember ordering them online from River Island years ago! 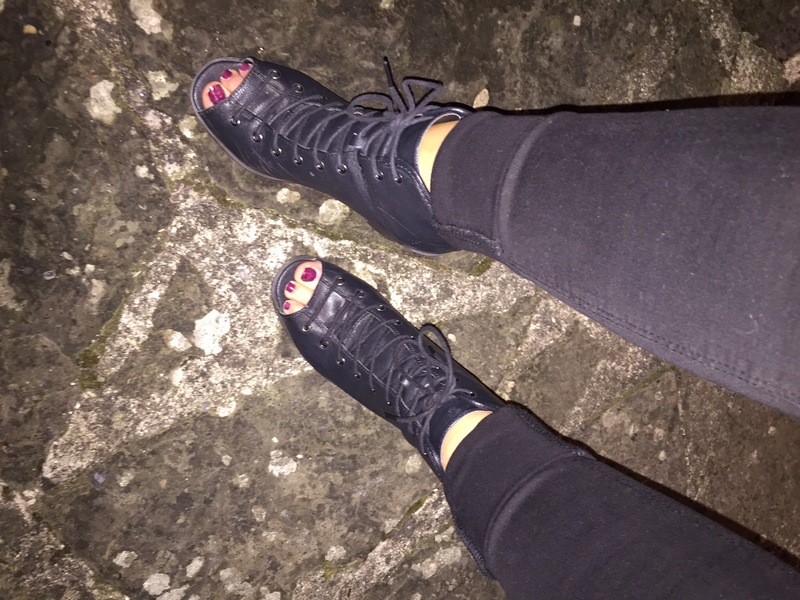 They were a great purchase as they are still in perfect condition along with being bang on trend. I went quite simple in terms of accessories. I wore a gorgeous neck piece from Penneys/Primark which tied in lovely with the black and grey along with reflecting well against the burgundy top. I wore my Pandora pieces and Marc Jacobs watch. My bag was a fab leather tassel clutch from Zara. I wore my fab ‘Halo’ hairpiece which is available from heavenly hair. I am currently working on a blog post which will cover all questions you may have about the hairpiece. A huge thank you to all of the girls in The Brow Artist Ranelagh for the invite to the event. 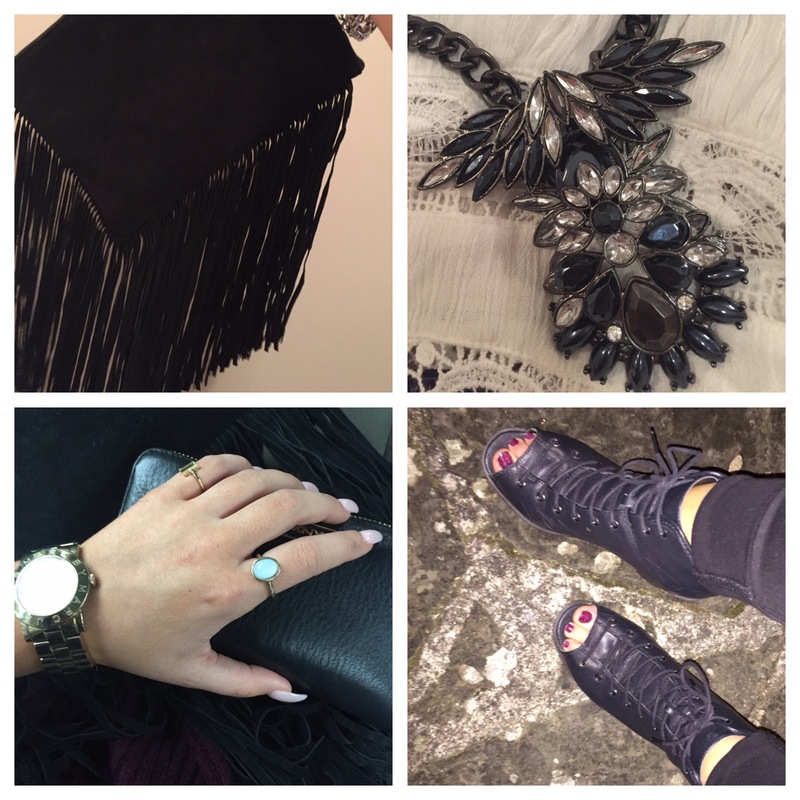 I hope this post has answered all your questions on my look! 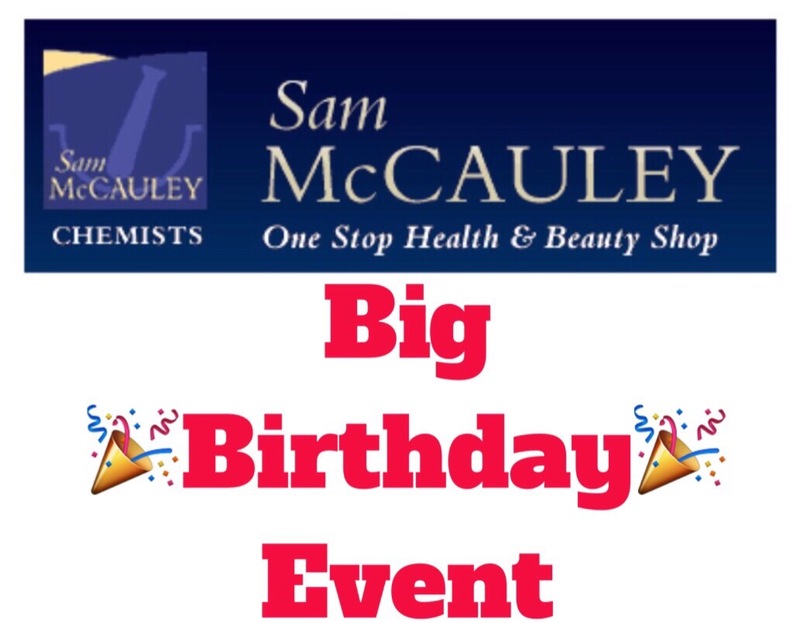 So as some of you may know, I was so kindly invited back to Sam McCauleys pharmacy to celebrate their birthday in the Fairgreen shopping centre Carlow on the 19th of September to capture the event and share it with you all! Let me tell you, what a day it was! During this post I am going to tell you all about the event and what went on throughout the day. I met so many fabulous followers who popped in to say hello along with spending the day with amazing people and fabulous brands. 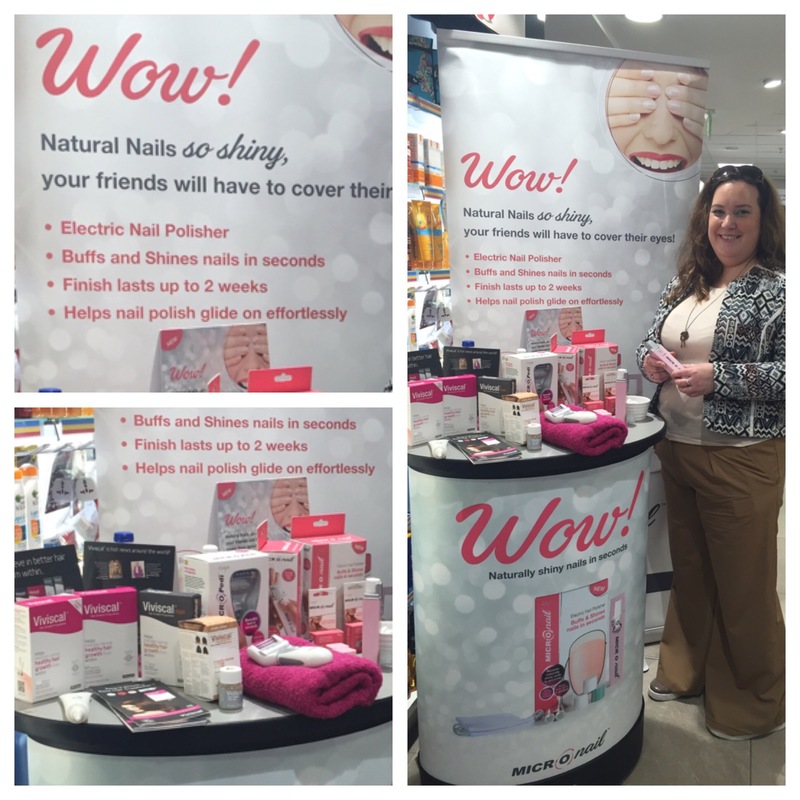 As always, Sam McCauleys pharmacy in the Fairgreen shopping centre Carlow know quite well how to host an event, but this one in particular blew me away! I wrote a pre-blog post on what was going to happen throughout the day for those who wanted a little taster of what they would be in for at the event, and I don’t think you guys were disappointed. 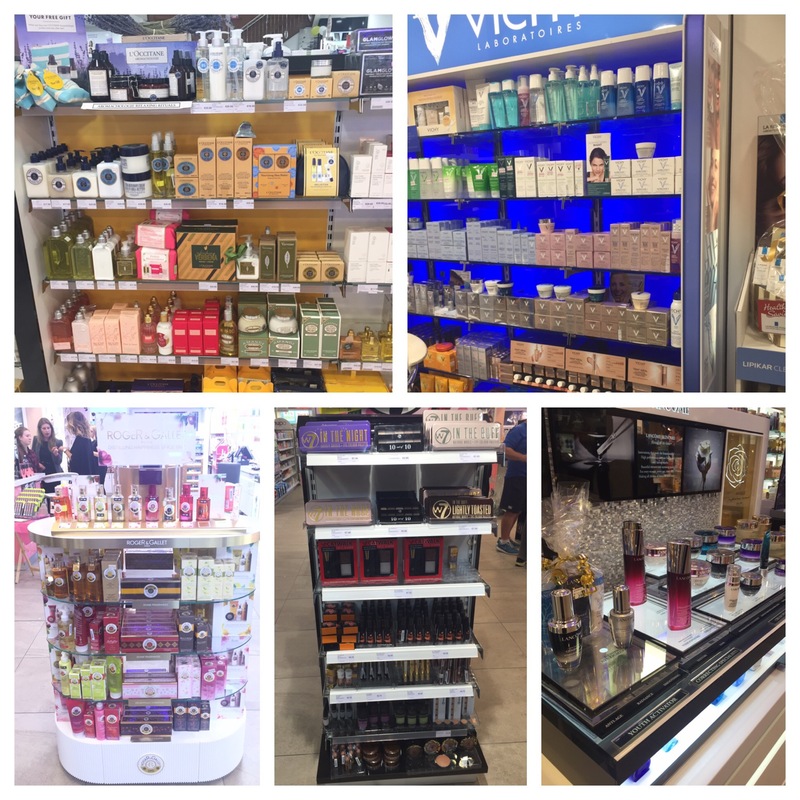 I received so many snaps from the ever growing media platform that is ‘snapchat’ of those in store and of all the bits and bobs they had picked up on the day with the help of the lovely ladies on all beauty counters, perfumery, pharmacy counter and photo bar. 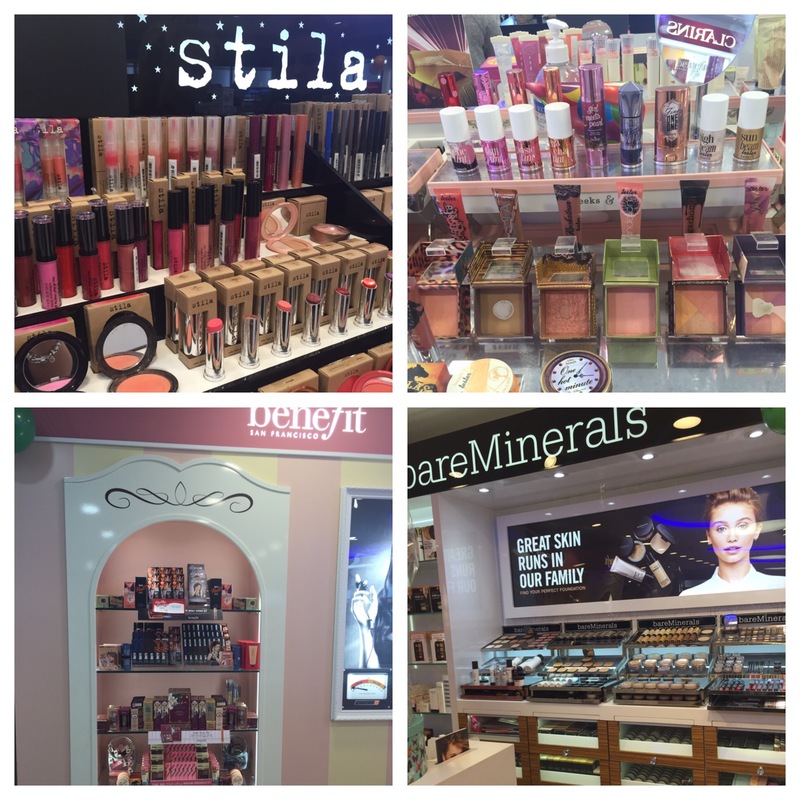 As Sam McCauleys in Carlow is the only holder of Stila, benefit and Bare Minerals in the area, these counters had fabulous small treats in store on the day. From amazing (huge) hampers to be won, to make overs and product testings to fantastic offers on sets and single products. 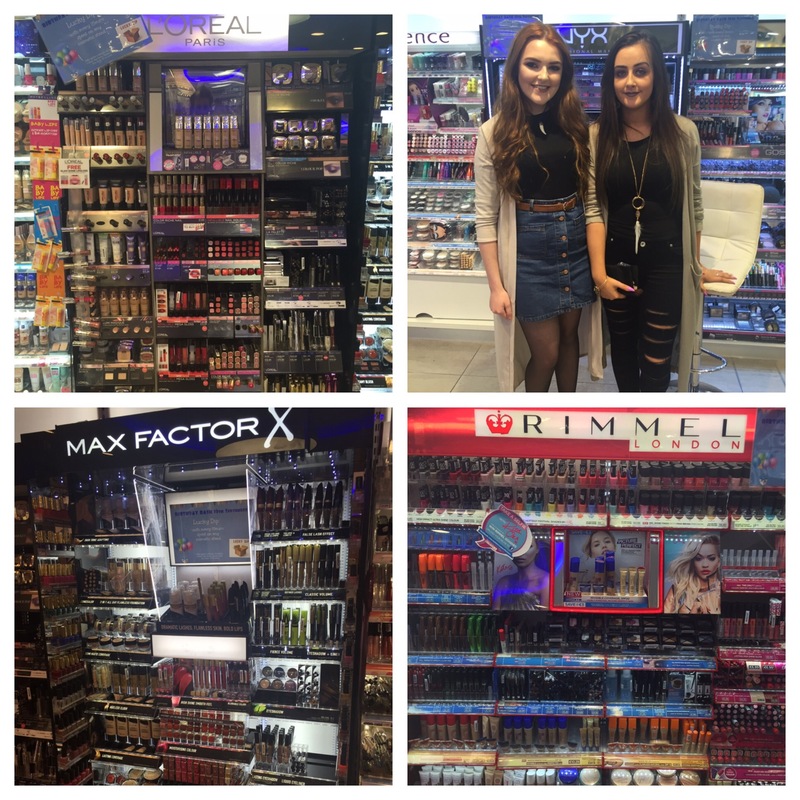 On the make up stands such as Rimmel, GOSH, NYX, Maybeline, essence etc, there were two fab make-up artists on hand, Roisin Hayden and Triona Brennen to help with anyone who needed guidance in the make up department or help with products. 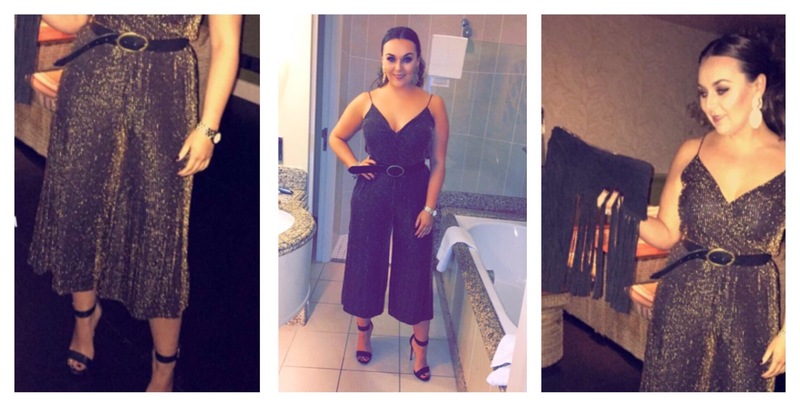 Roisin has been doing make up for over a year now and has amazing skills, and Triona is perfecting her skills at LA make up academy in Dublin. Be sure to check out their work over on Facebook. The make-up stand also had a fab offer on the day where if you spent €15 on any products, so you could mix and match, you would then have the chance of putting your hand in the lucky dip which meant you got a free product of your choice. 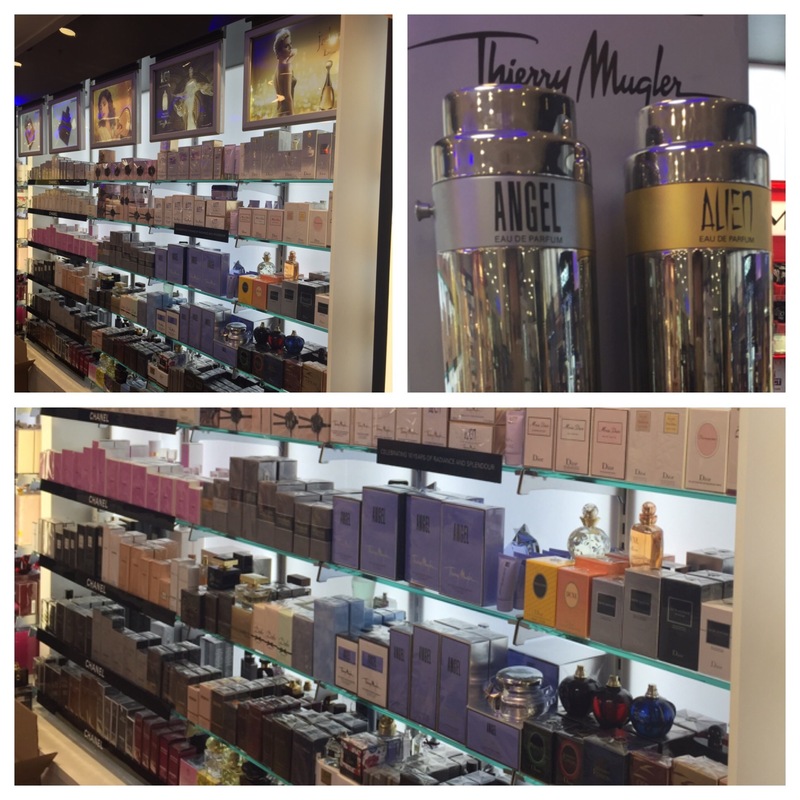 The perfumery had an absolutely amazing hamper up for grabs on the day of the event along with a brilliant offer which meant when you bought a perfume or spent a certain amount on a product, you got to choose a perfume for free! How amazing is that?! 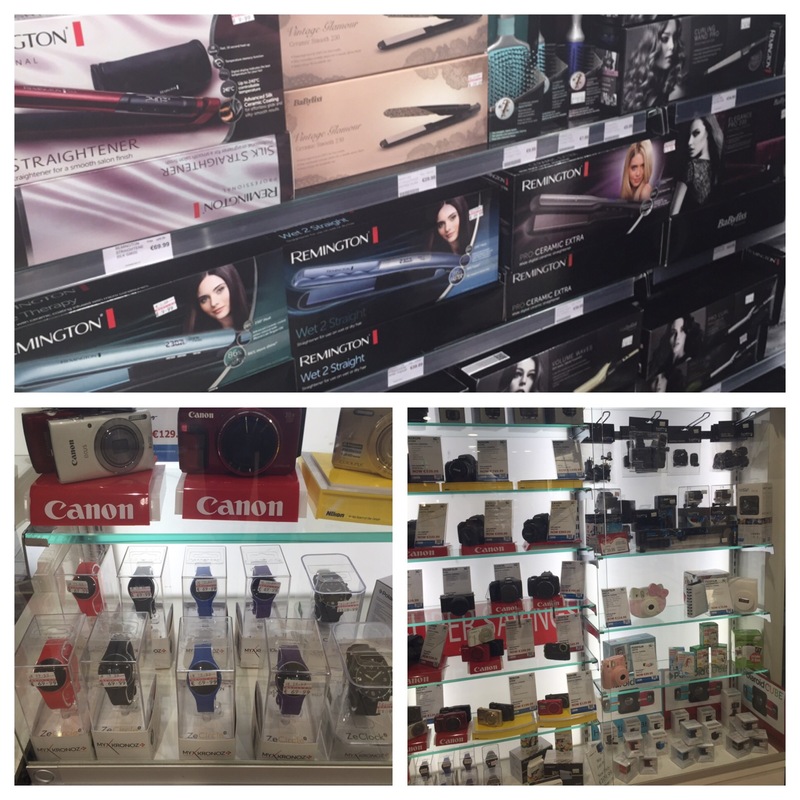 The guys at the photo bar were showcasing some fab new products along with some amazing offers on electronic pieces. One of the main pieces which I was intrigued by was the smart watches. These watches do almost everything including fitness, calorie counting, answering your phone and texts to tracking your steps. 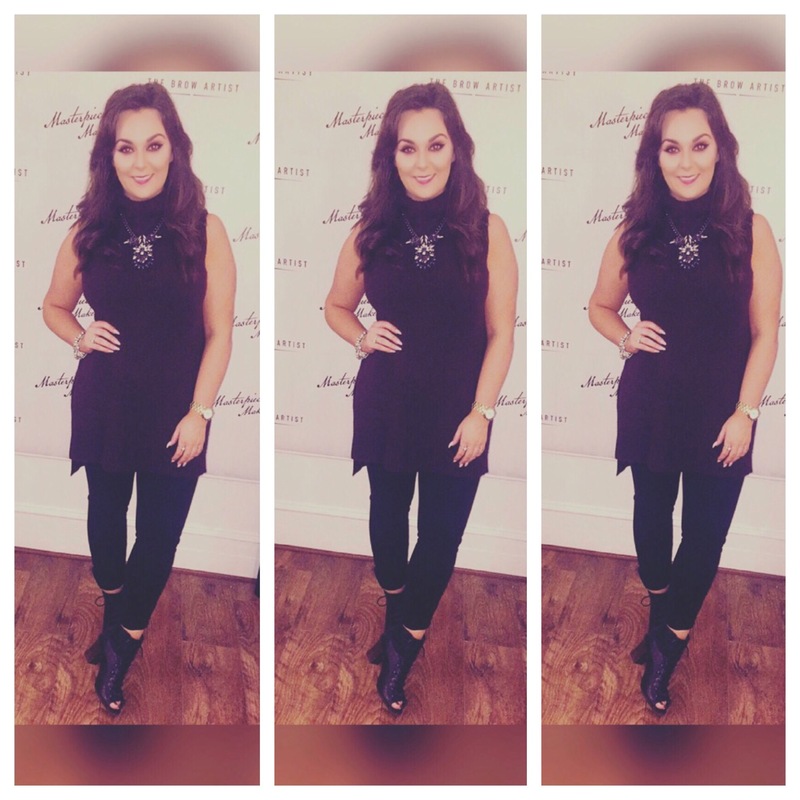 The fabulous Aoife was available on the day to talk all things nails and hair. Aoife was showing how to achieve gorgeous shiny nails in just seconds with the amazing device that is the Micro Nail, along with hair products from Viviscal – which are worth a look at as I have just started using the Viviscal conditioner which contains all natural ingredients as I suffer from a very dry scalp and this is working wonders on my hair! This had to be one of my favourites on the day! 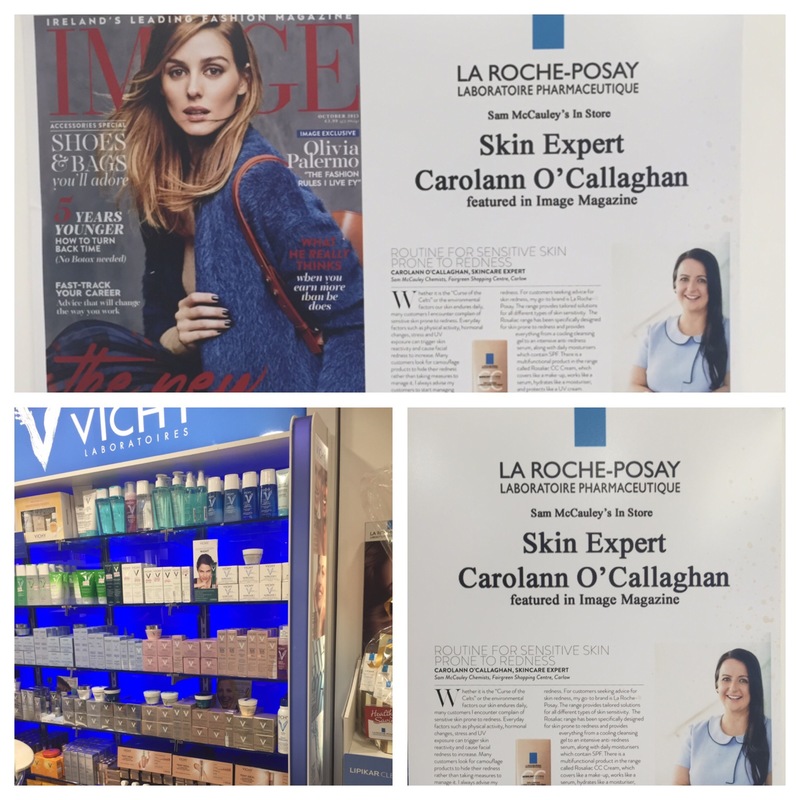 I met with award winning in-store skin expert, Carolann O’Callaghan to talk all things skin, and had my skin analysis done with her. Carolann is now in the October issue of IMAGE magazine which is an absolutely outstanding achievement. Overall it was such a fun day! I really hope all of you that popped in on the day had a really good time, because I know I did! Don’t forget to drop by and check out this amazing store as it has numerous brands to offer along with an amazing beauty salon, photo bar and specialists in the pharmaceutical area.